This fun 14k white gold fashion ring contains 0.23 carats of perfectly matched red rubies and 0.07 carats of round diamond accents set in a milgrain edged band. 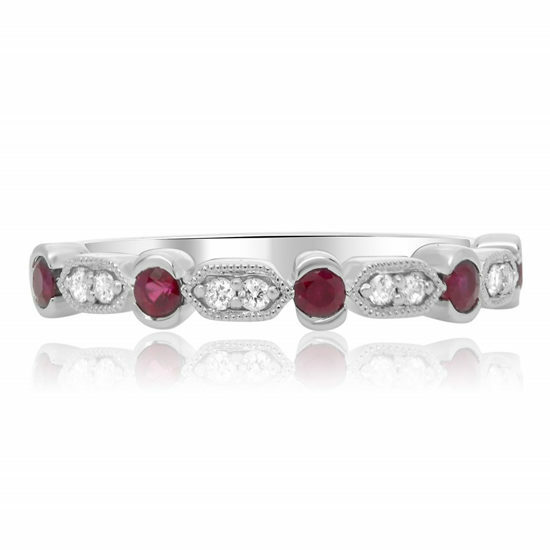 Ruby is the July birthstone and traditionally exchanged between lovers in ancient Europe. Ancient wisdom traditions tell us that Rubies can help bolster self-confidence, strengthen our confidence and ground us in our resolve to accomplish our goals.